Best pet hair vacuum ever... I love it! Are you looking for the best pet hair vacuum cleaner? I know how you feel. A few months ago, with two guinea pigs and a puppy, I thought my house will turn into a fur ball. I tried everything I could to keep the hair off the upholstery and keep the house as much pet hair free as I could. But sometimes, the best we can do is not enough. My puppy started shedding when the weather got warmer, and no matter how much I brushed her hair, it was still all over the place. So instead of trying to keep the hair away, I decided to relax and find the best pet hair vacuum cleaner to assist me in all this pet mess. How to find the vacuum cleaner you will love? Well, I started asking friends that have pets what they used. Then I started searching online and reading literally hundreds of reviews of different vacuums. And I found the perfect one, although I did not know it at the time. After all the search I decided to buy Bissell Pet Hair Eraser Dual-Cyclonic Upright Vacuum. I was a bit worried because the price didn't seem too high and you know how that usually turns out to be, low price low quality. But not this one, this pet hair vacuum is the best pet related purchase I have ever made. Of course, it was delivered pretty fast and I could not wait to test it. It wasn't all that hard to assemble it and it was time for the truth. Can it clean all the pet hair? Why I think this vacuum cleaner is the best for pet hair? I actually vacuumed the carpets and brushed the furniture before I tried the vacuum cleaner. I really wanted to test this vacuum from the first moment. Well, my new vacuum pulled out so much hair and dirt that I started to wonder how many pets I actually had! Not that my dog's "blowing coat" doesn't make enough mess. I cleaned the carpet and the upholstery so good I could not believe the stuff that was in the vacuum. It really did a great job. We all know kids develop allergies easy. With pets, that risk should be lowered since they are exposed to the allergens all the time and it affects them less. This vacuum cleaner will remove mites and pollen too. Still, keeping the house clean for the kids, especially if you have babies crawling, is very important. Eating pet hair is not all that tasty and good for the little ones. Another reason, being a parent or not, is time. I know how much time it took me before to clean the pet hair and all the mess they left around, like food and seeds. This vacuum is a time saver. I clean everything faster, and obviously better. So instead of spending your whole day cleaning the house, you can spend much less time on cleaning and more on playing with your kids and pets. I like that this vacuum will actually cover a fair amount of carpet at the same time. With good suction power, I don't have to run over a carpet 10 times with it. It is very easy to handle. I was afraid it might be too big for me to handle around the furniture, but I had no problems with it. 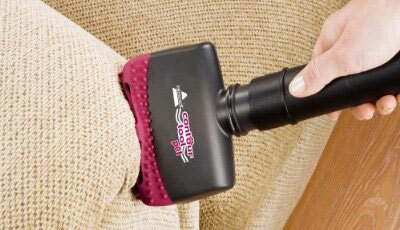 Pet hair lifter has to be my favorite thing with this vacuum cleaner and -- it comes with it. Talk about some fast pet hair cleaning. Things I also like, but I guess that is the reason I think this is the best pet hair vacuum, are two other brushes: pet TurboBrush and pet contour tool for hard to reach spots. Another thing I like is the filtering system. It has, what they call cyclonic action that actually keeps most of the dirt out of the filter, so you won't have all that mess coming back out.